Wherever Daniel Suárez has raced on his way to competing in the elite Monster Energy NASCAR Cup Series, the 27-year-old driver from Monterrey, Nuevo Leon, Mexico has won. From go-karts to the NASCAR PEAK Mexico Series to the NASCAR K&N Pro Series to the NASCAR Truck Series to the NASCAR Xfinity Series, Suárez has proven his mettle by winning. 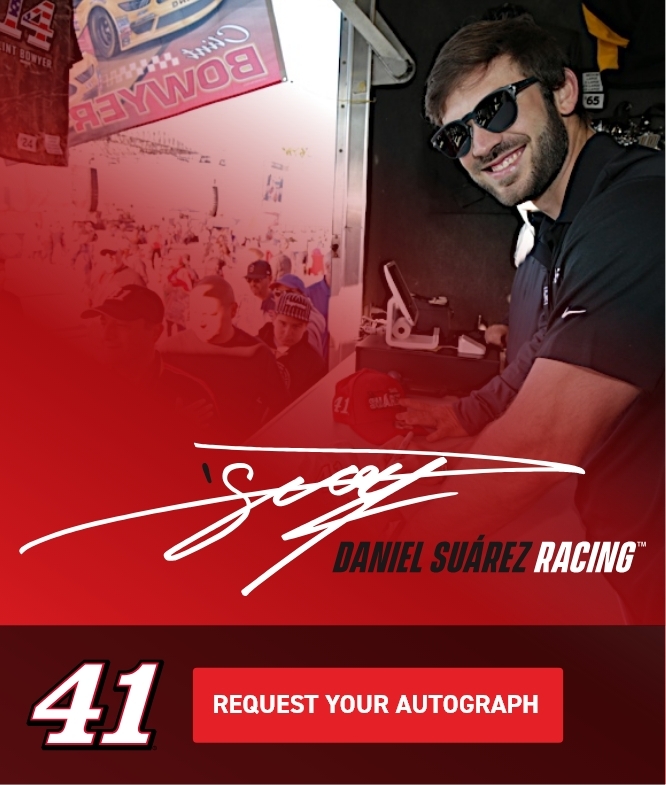 After marching to the 2016 Xfinity Series championship in a breakthrough season that saw Suárez become the first Mexican-born driver to win a NASCAR national series race, Suárez was thrust into the NASCAR Cup Series in 2017. In two seasons with Joe Gibbs Racing (JGR), Suárez made 72 starts. He tallied 21 top-10 finishes with a best result of second on July 29, 2018 at Pocono (Pa.) Raceway, a race where Suárez led the field after securing his first career NASCAR Cup Series pole a day earlier. But Suárez is used to winning, and he has constantly parlayed success to advance his career. 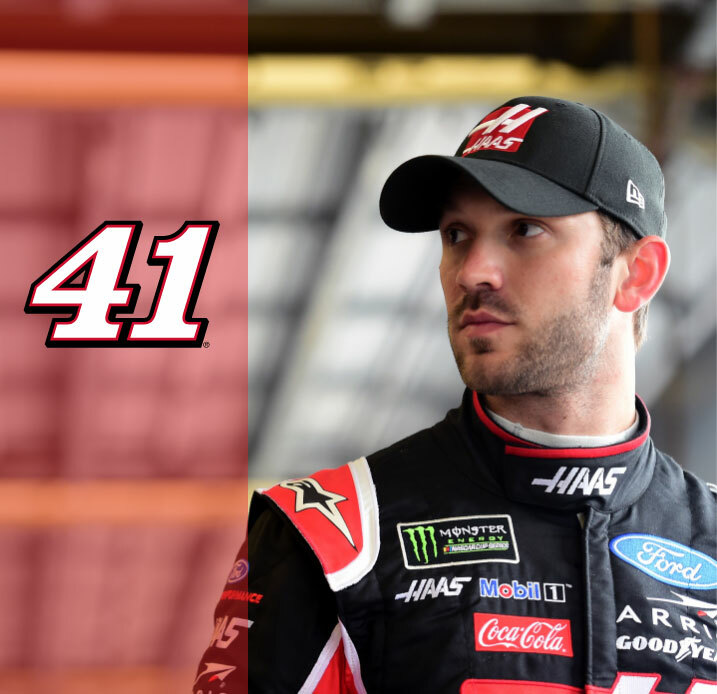 It’s why he transitioned to Stewart-Haas Racing (SHR) in 2019, taking over the No. 41 Haas Automation/ARRIS Ford Mustang led by veteran crew chief Billy Scott. Competed fulltime in mini-stock division, earning the most wins in the series. Raced Volkswagen Beetles in Volks Sports Series presented by Mobil 1 at Autodromo de Monterrey. Won championship. Competed in go-karts at local and regional level inMexico. Won local track championships. Two-time Mexican national karting champion (2004 and 2008). Twice competed in Rotax MAX Challenge Grand Finals karting event (2004 in Spain and 2008 in Italy). Competed in two Xfinity Series races – one for JGR and one for RAB Racing. Made Xfinity Series debut April 25 at Richmond (Va.) Raceway. Finished 19 th for JGR. Made ARCA debut Sept. 19 at Kentucky. Finished fifth and led twice for a race-high 39 laps in lone ARCA start of 2014. Made Truck Series debut Oct.18 at Talladega (Ala.) Superspeedway. Finished 15 th in lone Truck Series start of 2014.
at Daytona – and earned four top-fives and seven top-10s and led a total of 223 laps. Nuevo Autodromo de Aguascalientes in Aguascalientes, Mexico. Aguascalientes; and Nov. 9 at Autodromo Miguel E. Abed in Amozoc, Mexico. Competed fulltime inNASCAR K&N Pro Series East for Rev Racing.Finished third in points. Earned first career K&N Pro Series East win July 13 at Columbus (Ohio) Motor Speedway. Completed K&N Pro Series East season with six top-five and nine top-10s. Led a total of 209 laps. Fourth full season in NASCAR Mexico Series. Finished second in points with six top-fives and nine top-10s and a total of 328 laps led. Earned three Mexico Series wins – May 12 at El Dorado Speedway in Juan Aldama, Mexico; June 30 at Autodromo de Monterrey; and Nov. 10 at Autodromo Hermanos Rodriguez. Scored four Mexico Series poles – April 21 at Nuevo Autodromo de Queretaro, Mexico; May 12 at El Dorado Speedway in Juan Aldama, Mexico; Oct. 27 at Autodromo de Chiapas; and Nov. 10 at Autodromo Hermanos Rodriguez. Competed in partial NASCAR K&N Pro Series East and West schedules. Made one K&N West Series start at March 3 at Phoenix. Finished third. Made nine K&N East Series starts. Earned one top-five and three top-10s. Best finish was fifth at Columbus. Third full season in NASCAR Mexico Series. Finished third in points with nine top-fives and nine top-10s and a total of 366 laps led. Earned two Mexico Series wins – May 12at Autodromo Hermanos Rodriguezand Aug. 12 at Nuevo Autodromo de Queretaro. Won three Mexico Series poles – April 15 at Autodromo Potosino; Aug. 12 at Nuevo Autodromo de Queretaro; and Aug. 26 at Nuevo Autodromo de Aguascalientes. Competed in first stock car race on U.S. soil – the Jan. 29 Toyota All-Star Showdown at Irwindale (Calif.) Speedway. Started 12th and finished 11th in 40-car field. Earned one top-10 in two K&N West starts. Best finish was seventh Nov. 12 at Phoenix. Led seven laps. In seven K&N East starts, captured one top-five and three top-10s. Best finish was fifth at Columbus. Second full season in NASCAR Mexico Series. Finished ninth in points with three top-fives and seven top-10s and a total of 47 laps led. Won three Mexico Series poles – Aug. 21 at Autodromo de Monterrey; Nov. 6 at Nuevo Autodromo de Aguascalientes; and Nov. 27 at Autodromo Hermanos Rodriguez. First fulltime season in NASCAR Mexico Series. Achieved Rookie of the Year honors. Finished 13th in points with one top-five and five top-10s.Best finish was fifth Aug. 22 at Autodromo de Monterrey. Competed in four NASCAR Mexico Series races. Made Mexico Series debut Sept. 6at Autodromo Miguel E. Abed. Finished 14th to earn best result of season. Competed in partial mini-stock division schedule, a NASCAR Mexico support series featuring four-cylinder stock cars. Earned Xfinity Series championship in second full season. Won three Xfinity Series races – June 11 at Michigan International Speedway in Brooklyn; Oct. 2 at Dover (Del.) International Speedway; and Nov. 19at Homestead-Miami Speedway. Victory at Homestead clinched Xfinity Series title. In winning first Xfinity Series race at Michigan, became first Mexican-born driver to win a NASCAR national series race. Captured three Xfinity Series poles – March 19 at Auto Club Speedway in Fontana, California; July 30 at Iowa Speedway in Newton; and Nov. 19 at Homestead. Earned 19 top-five and 27 top-10s and led a total of 347 laps for JGR. Captured first career NASCAR Truck Series victory Nov. 11 at ISM Raceway near Phoenix. Led twice for 34 laps. Truck Series victory came as part of 13-race race schedule for Kyle Busch Motorsports (KBM). Earned three top-fives and six top-10s and led a total of 219 laps. First full season in Xfinity Series. Finished fifth in points and won Rookie of the Year title. Captured three Xfinity Series poles – July 4 at Daytona; Aug. 1 at Iowa; and Sept. 26 at Kentucky Speedway in Sparta. Competed in 13 Truck Series races for KBM. Earned seven top-fives and 10 top-10s and led a total of 44 laps. Made four ARCA starts. Earned one top-five and two top-10s and led 68 laps. Best finish was secondFeb. 14 at Daytona. Won first career ARCA pole Oct. 16 at Kansas Speedway in Kansas City. Second full season in Monster Energy NASCAR Cup Series. Earned three top-five and nine top-10 finishes and finished 21st in points for Joe Gibbs Racing (JGR). Led a total of 35 laps. Captured first career NASCAR Cup Series pole July 28 at Pocono (Pa.) Raceway. Competed in two NASCAR Xfinity Series races for JGR. Finished eighth in season-opening race Feb. 17 at Daytona (Fla.) International Speedway and fourth June 30 at Chicagoland Speedway in Joliet, Illinois. Ran one NASCAR K&N Pro Series West race at Sonoma (Calif.) Raceway. Finished fourth. First full season in NASCAR Cup Series. Made NASCAR Cup Series debut Feb. 26 in Daytona 500. Finished 29th. Earned one top-five and 12 top-10s and finished 20th in points for JGR. Led a total of 40 laps. Competed in 14 Xfinity Series races for JGR. Earned five top-fives and eight top-10s and led a total of 180 laps.